World Movie Series - 2 - Amores Perros ~ Scorp's Say ....! In this world, our lives are affected by others as well. Sometimes, when we are in to our casual activities, we might have noticed about the part played by other people in our lives, which form a part of their day to day activities. All our lives are interconnected, thus. What will happen if three such lives collide together, with a series of incidents? This forms the crux of Amores Perros. The film begins with a car chase in Mexico. We see a car being chased fiercely by a truck. In the car are Octavio, a young lad, and his friend. They have a brutally wounded dog at the back seat. The truck advances towards the car, and the people in the truck point their gun towards the car and they start shooting. Octavio drives the car frantically, to escape the shooters and at the end of the chase, rams his car in to another car. We immediately cut in to a chapter named ‘Octavio and Susana’. We see a house. A lady approaches and opens it. As soon as the door is opened, a dog runs out, and the lady curses the dog, goes a few steps to catch it but returns empty handed, and goes in to the house. We then cut in to a crowded area, with the floors drenched with blood. There are two people standing in the middle of the small clearing, with each holding a huge dog. Both the dogs are barking fiercely and suddenly, they are released. They both fight ferociously and one dog is killed by the other dog. We see Jarocho, the owner of the winning dog. He comes out of the arena, with his gang, and his dog is still fierce. So he decides to let it out on the street dogs he sees, but we see El Chivo, a bearded man, looking like a beggar, standing near the dogs. They are HIS dogs. Seeing El Chivo, Jarocho backs up and his friend points to a black dog standing on the other end of the road. It was the same dog which escaped from the house initially. Jarocho and his friends laugh out aloud and start chasing the dog, to let his dog fight and kill the black dog, to gratify its ferocity. We cut in to Octavio, who is the owner of the black dog. His door is knocked, and when he comes out, his friend tells that his black dog (Cofi) has killed Jarocho’s fierce dog, which was a champion in local dog fighting. A surprised Octavio gets confronted by Jarocho, who tells that he needs to account for his dog’s death. Jarocho wants Octavio to handover Cofi to him. Octavio refuses, and goes in to the house. Jarocho warns Octavio and goes away. Octavio has an elder brother, Ramiro. Susana is Ramiro’s wife. Octavio has known Susana even before her marriage with Ramiro, and he likes her. Ramiro is a rogue, who robs shops, and Susana is unhappy about this. Octavio tells Susana that they can run away to a new place, and start to live together. Susana tells Octavio he doesn’t understand, and she refuses. Octavio thinks it was due to the fact that he has no money, and hence, decides to compete in the Dog fights with his dog Cofi. Octavio cuts a deal with the local thug Fatso, who arranges dog fights, to be in partnership for eight matches. Cofi goes on winning all the eight matches, killing mostly Jarocho’s dogs. Jarocho is enraged to the core. Meanwhile, we see El Chivo, the beggar look alike, killing a person in a restaurant. We also see him read a newspaper, and he becomes emotional reading about the funeral of a lady. He goes to the funeral, attends it and talks to a lady. We come to know that he is talking to his sister-in-law and the lady died, was his wife. We learn that his daughter thinks he is dead. He then returns to his home. We cut to Octavio’s brother Ramiro threatening him to give him half the money Octavio earns in the dog fight. Else, Ramiro says he‘ll shoot the dog. We now see Daniel, publisher of a magazine, and his wife and two daughters. He secretly is talking to someone, and tells the person not to call him at home, since his wife is suspicious. Now, Jarocho calls for a big match with Octavio. He places the bid as 40,000 pesos. Octavio has given all the money he won so far to Susana. Enraged by his brother Ramiro threatening him and by Ramiro’s ill treatment towards Susana, Octavio tells Fatso, the local goon, to beat up Ramiro. Ramiro gets beaten badly, and when Octavio comes home, he is told that Ramiro has gone away with his wife and child. Octavio instantaneously searches the money Susana has hidden, and it’s all empty. Susana has taken all the money with her. Octavio gets pissed off, and he anxiously arranges somehow for 20,000 pesos and goes to the match. In the match, Jarocho’s dog is about to be killed by Octavio’s dog Cofi when Jarocho shoots Cofi. Octavio doesn’t expect this and shouts at Jarocho, who coolly orders Octavio to get out. Octavio takes the dying dog, comes out, but decides something, walks in, stabs Jarocho in his stomach, and runs out and goes off in his car. Jarocho’s friends chase Octavio in a truck, and we realize this is the first scene of the movie, where Octavio rams in to a car at the end of the chase. We now are shown the next chapter of the movie – ‘Daniel and Valeria’. We have already seen Daniel, publisher of a magazine. He has an affair with the supermodel Valeria, and he divorces his wife and comes to Valeria to live in an apartment. While Valeria is driving her car, suddenly another car rams on her car, and Valeria is badly injured. The screenplay blends two stories beautifully here – Octavio ramming his car at the end of the car chase and Valeria’s happiness shattered by the accident. Her leg is broken, and Daniel takes care of Valeria. Valeria has a dog, and one day the dog enters the opening in the wooden floor, in their apartment. From that day, Valeria becomes hysterical and she curses Daniel, who fights with Valeria. One day, while Daniel comes home, he finds the floor broken at many places, and Valeria, lying motionless in her room. The doctors tell Daniel that she has wounded her leg badly while trying to open the floor, and as a result, Gangrene has crept in, and they have removed her leg. This shatters Valeria totally, as she was a supermodel once. The third chapter begins. ‘El Chivo and Maru’. As we have seen, El Chivo is the beggar look alike, who actually was a revolutionist (A guerilla). He ran away from his wife and daughter with an intention of changing the world, but has failed in his attempt and is now a vagabond. His wife has died, and his daughter Maru thinks he is dead. He is approached by his friend, who introduces him a person and says El Chivo has to kill that person’s partner, as he is cheating him. El Chivo accepts, gets half the money and goes after the person he needs to kill. While he is about to shoot, El Chivo witnesses a terrible car accident. He sees a car ramming another car. He runs to see the driver (Octavio) shouting in pain in a car. El Chivo finds 20,000 pesos in Octavio’s packet and grabs the money. He also finds Octavio’s wounded dog (Cofi) and takes it home. People take Octavio to the hospital. In the crashed car, Valeria wriggles in pain, as her leg is broken. El Chivo cleans the dog’s wounds and places it with his other dogs. 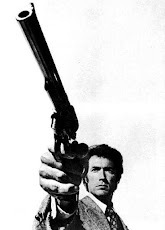 He goes out and when he returns, he finds all his dogs killed by Cofi, and angrily, he takes his gun out to shoot Cofi, but he can’t shoot the dog. He then goes out and captures the person whom he was paid to kill. He brings him home, ties him up and reveals him that it was his partner who wanted El Chivo to kill him. We cut to Octavio, attending his brother’s funeral (as his brother tries to rob a bank and gets shot by the person who comes to El Chivo for the killer deal). At the funeral, Octavio again asks Susana to run off with him. He tells her he’ll wait at the bus station the next day night. But, seeing Susana not turning up the next night, he walks sadly away from the bus. Next day, El Chivo calls up that guy, tells him he has finished his partner, and asks him to come to El Chivo’s home with the remaining money.When he comes, he ties down that person also, and tells them both to settle their dispute and places a gun too, on the floor. He cuts his long hair, shaves, and takes all the money he gathered, and leaves for his daughter’s home. He sneaks in, places all the money, dials the daughter’s phone, and tells her that all his life, he was a loser, and when he deserted his wife and daughter years ago, he believed that he can change the world, and now he knows that he is a loser. He tells her he is alive, and one day when he is able to look at her eyes straight, he will return to her. He leaves the house, starts walking on the road along with Cofi. The movie ends. Amores Perros is a strong film about relationships, the love which we have underneath in our mind for the people we like, and how reality changes us. We see El Chivo as a murderer initially. But, as the movie progresses, we learn that he yearns for his wife and daughter like anything. He wants to live a peaceful life with them, and when he learns the news that his wife had died, he is not able to even go to his daughter, his only solace, and decant his grief. He goes to the cemetery like a beggar, stands there, watches his daughter from a distance, and returns. At times, we see El Chivo sneak in to his daughter’s house, and once he steals the photograph which has his wife and her sister with his wife’s husband. He sticks his photograph on the face of his wife’s husband, and later on, after he has shaven his beard, takes new photographs and replaces his old bearded one in the picture. He places it at the end at his daughter’s house, before leaving the house. This shows the love he has in his mind towards his daughter with whom he could never be able to live. . . This Spanish movie got released in the year 2001. It was directed by Alejandro González Iñárritu (21 grams, Babel). The movie was nominated for the Oscars under best foreign language film in 2001. The screenplay is unique, as it first shows an incident (accident) and then links the lives of three people as to how their lives got changed after the accident. 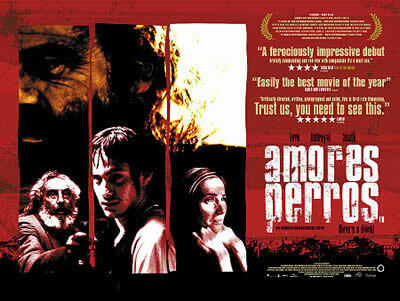 A striking film, which is very realistic, I’m sure Amores Perros will capture your heart. PS:- In 2002, Mani Rathnam made a copycat attempt of this movie. It was released as ‘Aytha Ezhuthu’ in Tamil and as ‘Yuva’ in Hindi. It was a failure, as it had many irrelevant scenes. The initial accident sequence was exactly copied in this movie, and the non linear screenplay of the movie too was copied. But since it has too many irrelevances, the movie ultimately flopped.